Early morning design drafts and posting videos. In May 2015 we decided that I was going to quit my job. I had spent 3 years teaching in CPS (Chicago Public Schools) as a High School English and Drama teacher, and I absolutely hated most of it. When I talked it over with Dennis, pondering to myself what I might do with an Education and Acting degree when I no longer wanted to teach or act, he suggested that I come work with him at D’Flo Productions. I did not go to school for business management, marketing, graphic design, or film editing. I had zero training for this new job. There were a whole host of people who I thought would be disappointed that I quit teaching. I also had no idea how to explain my new job to people. (I still don’t exactly know how to do this). To be perfectly honest, this entire year so far–from June 2015 until today– has been one huge trial and error process, and it’s scary to admit that to people. The question “Am I enough?” posed in Dennis’ song entitled All I have to Give really hits home during this season. This is all I have to give? Is it enough? Am I enough? What I have learned so far with living life as a full-time artist is that doubt kills creativity and breeds a crippling kind of fear that doesn’t allow me to get any work done. 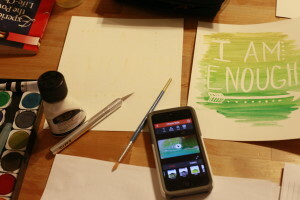 Each time I sit down with my paints, or with Adobe Illustrator, stand behind the camera, or hover over the “publish” button, I ask this question: “Is it enough?“. And then I ask, “Am I enough?” Because, like most human beings, my identity and self-worth often gets tangled up in my work. Since June, I have gotten much better at describing what I do for a living. Heck, since this past Thanksgiving, things have gotten a lot clearer. 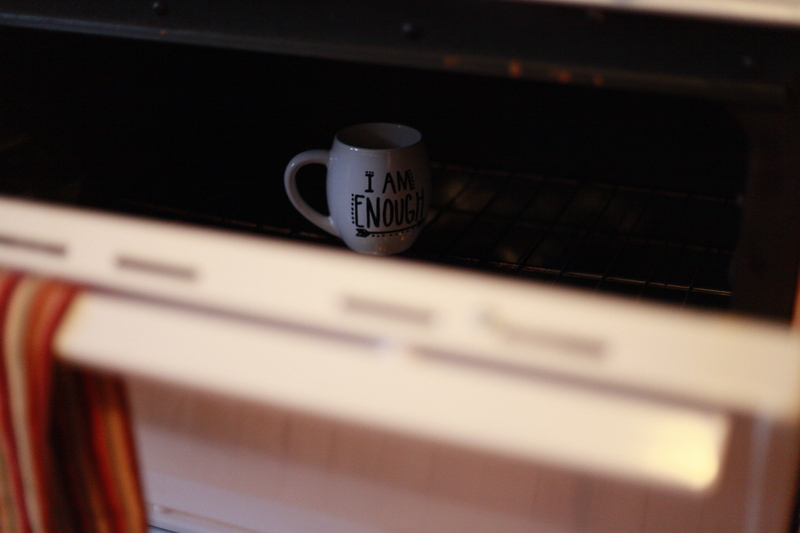 Baking the hand painted “I am Enough” mug for the Instagram #DFloProGiveAway for Feb. 2016. But there are days when I question all that I’m doing. There are days when it takes me longer than I think it should to complete a Photoshop edit, or when my well-meaning and wonderful mom calls and mentions that I should reconsider teaching in another district. There are days when the fear of failure or judgement from others makes me too doubtful to even start a project. There are days when I wonder if what I have to offer will ever be enough to make our career grow in the ways we want it to. Dennis and I can have productive business meetings, and I’ll still feel directionless. We can come up with great promotional ideas, and I’ll still be scared to put them into action. I can get really really good at photoshop, and I’ll still doubt my artwork and photography skills. He can write the most innovative song in the world, and we’ll still wonder if people really like it. It will never be enough… without Jesus. My sufficiency– my “enoughness”– comes from Jesus. And as I share this with you all, my honest vulnerability allows me to acknowledge my own limitations and weakness and doubt so that I can lean on His grace and His guidance. This is the only way I can dive in deep with my art and work. This is the only way I have the confidence to do that. 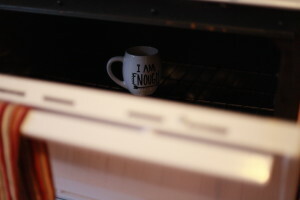 I know that this is what Dennis means in his song when he sings “I am enough. All through You, Jesus.” And I know that he goes through the same struggles about his work and it’s meaning and influence. 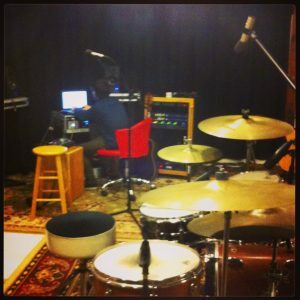 Dennis at the recording studio in Seattle. Sometimes it’s hard for him to hit record, or to step out onto that stage, or to have the confidence to share a new guitar lick he’s been working on. At the beginning of our time working together, he even mentioned being nervous to practice singing in his office, knowing that I was in the house and would hear him. This is something that we all struggle with. But not all of us turn to where–or rather, who— we need to in order to receive the confidence in our work and selves that we so desire. When you listen to Dennis’ song, or look at my “I am Enough” designs, I pray that you will remember that little line in the song that acknowledges where our “Enoughness” really comes from. And I hope you’ll see that when you choose to be vulnerable, even with just yourself, your strength can made perfect in that weakness. Then you can dive in deep anyway.